Minimal Wave next releases – Schedelvreter, The Minimal Wave Tapes: Volume 2, etc – Chain D.L.K. Minimal Wave is proud to announce our 34th release, a limited edition hand-silkscreened 10″ of Schedelvreter (which loosely translates as “Skull Gobber”), the Dutch side project of brilliant minimal synth pioneer Danny Bosten, best known for his project Das Ding. The seven tracks were originally recorded in Danny’s home studio in the Netherlands and self-released on a cassette entitled “Hunker” via his Tear Apart Tapes label in 1985. 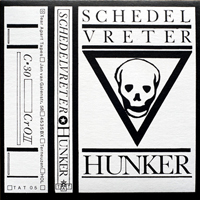 Unlike Das Ding, Schedelvreter is not pattern-based or sequenced, the synth sounds are hand played over a collage of found sounds. At the time, Danny was experimenting with a Crumar synth that was falling apart, and would sporadically create sounds that were like human voices. He created massive drum sounds by layering noise, using leftover four-track additions in reverse and some live drum recordings courtesy of his brother’s tapes. The end result feels narrative and filmic, like the soundtrack to an imaginary apocalyptic movie : bleak and desolate. The newly remastered 10” release is limited to 999 hand-silkscreened numbered copies pressed on black medium weight vinyl. Purchase here, $15. Click on song titles for links to audio samples. 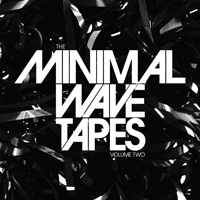 Out on February 27th, Minimal Wave proudly presents V/A The Minimal Wave Tapes: Volume 2, a collaborative release with Stones Throw Records and follow up to V/A The Minimal Wave Tapes; Volume 1. A collection of rare electronic music compiled from bands around the world, most of the songs were recorded in the 1980s and originally released on limited edition cassettes or vinyl by the artists themselves, and only a handful of people knew about them. Now they’ve been remastered from their analog source tapes, brought to you by Veronica Vasicka and Peanut Butter Wolf. Some ot the tracks are highlights of Minimal Wave’s recent output and others are glimpses into future releases. Listen to sound samples here. Read Five Minutes with… Veronica via FACT Magazine here. Huge thanks to all the artists involved. Check out the Minimal Wave Tapes: Volume 1 review here (Pitchfork voted “Best New Reissue” of 2010) and The Wire’s review here. 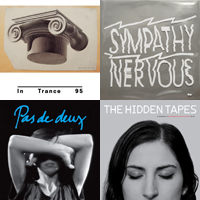 Check the Stones Throw Podcast series on iTunes this week for forthcoming Minimal Wave podcast. For event details, check the Minimal Wave Facebook page.